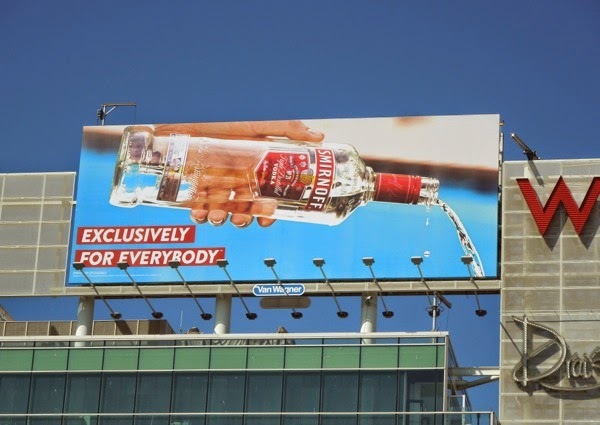 Now here's a clever visual gimmick that caught Daily Billboard's eye recently for Smirnoff Vodka's 'Exclusively for everybody' outdoor advertising campaign. 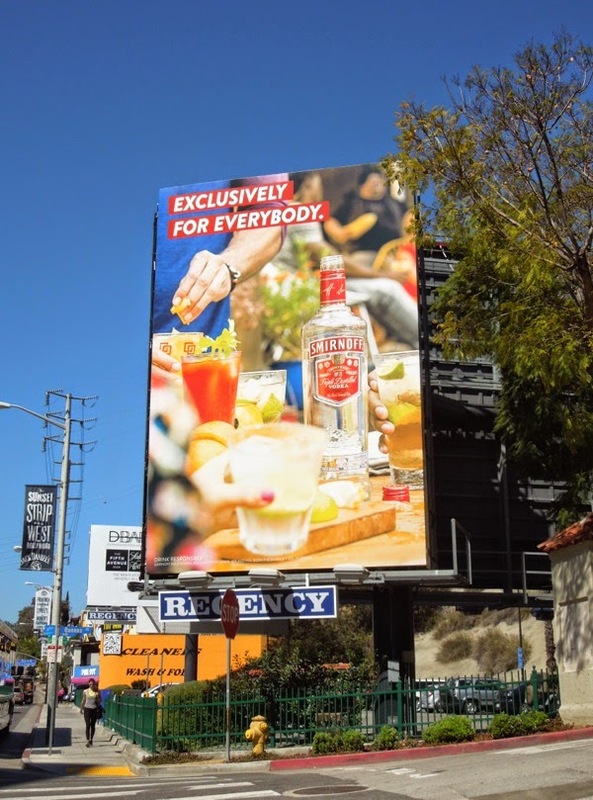 Daily Billboard first spied this 'Exclusively for everybody' campaign back around April 7 this year, with the portrait ad and a landscape version reappearing in the skies of L.A. around September 14, 2014. 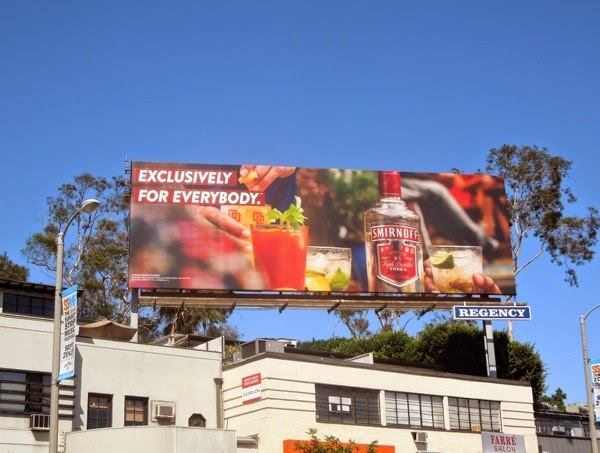 This new lifestyle treatment with people making cocktails with the vodka does differentiate it from other brands, but the rather cheap and gaudy choice of colours, red, white and blue, even the 'exclusively for everybody' seems to cheapen the offering, making Smirnoff No. 21 feel like an everyday vodka and not special or particularly premium. The photography used in the lifestyle ad creatives and the approach itself seems a bit old-fashioned and dated, but maybe that's the objective. 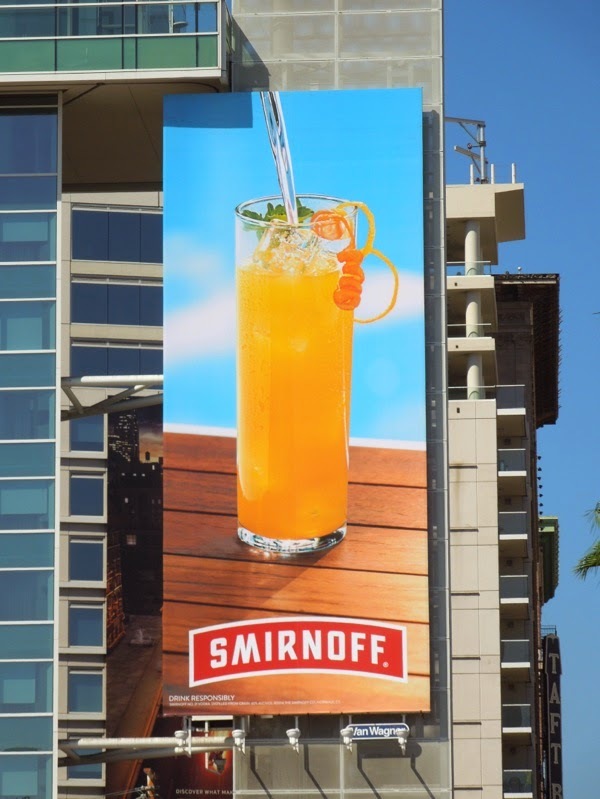 There's also the question of whether any of the gay community's boycott of Russian vodka, due to the country's persecution of their gay population and their homophobic policies had anything to do with this new inclusive brand treatment, as Smirnoff started as a Russian vodka but has long since changed hands and is now owned by British company Diageo. 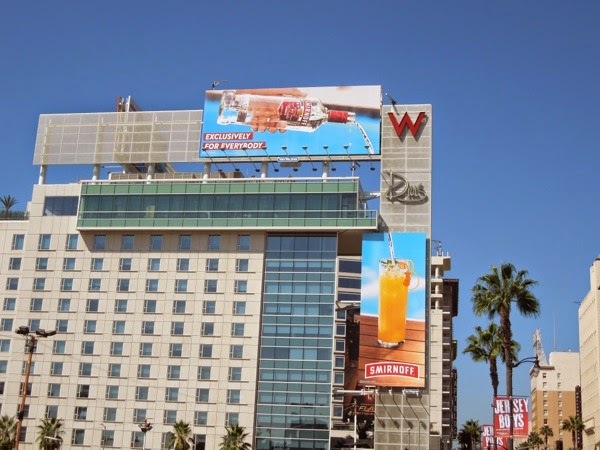 With that said, there's no denying that this duo of billboards, with the Smirnoff Vodka being poured into a waiting cocktail glass on the billboard below the other, snapped on the side of the W Hotel in Hollywood on September 18, 2014, isn't a fun approach. 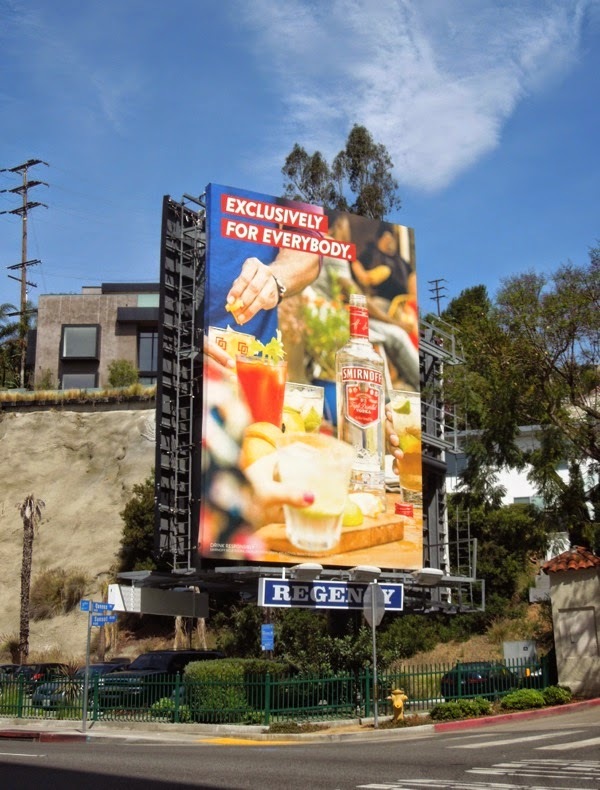 If you're a vodka fan, be sure to compare these ads to these other vodka brand outdoor ad campaigns from recent years, including the likes of Sobieski, Cîroc, Svedka, Belvedere, Ketel One, Absolut, Grey Goose and more besides. 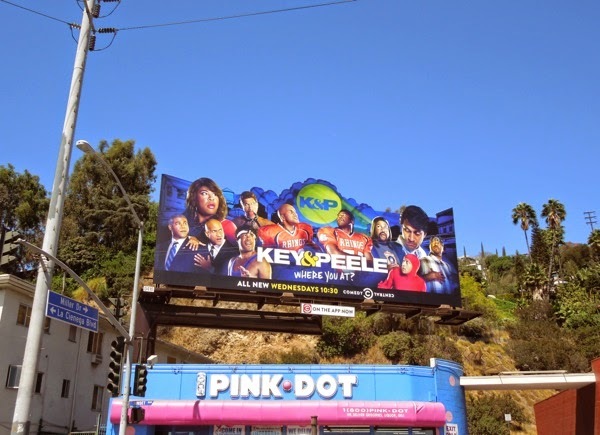 You know you're made it when you're gracing the front cover of Entertainment Weekly and you're guest-editing their comedy special issue, it's not a bad way to herald the start of the fourth season of Key & Peele's Comedy Central sketch show. 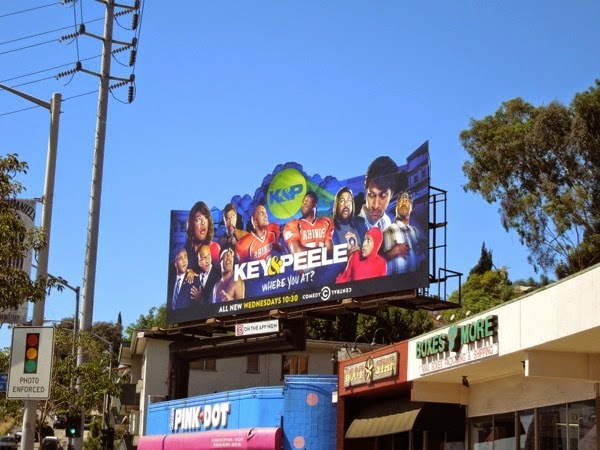 The critically-acclaimed comedy duo of Jordan Peele and Keegan-Michael Key are back and bolder than ever with this special extension billboard along the Sunset Strip, showcasing just a selection of the wide range of their infamous characters, old and new. 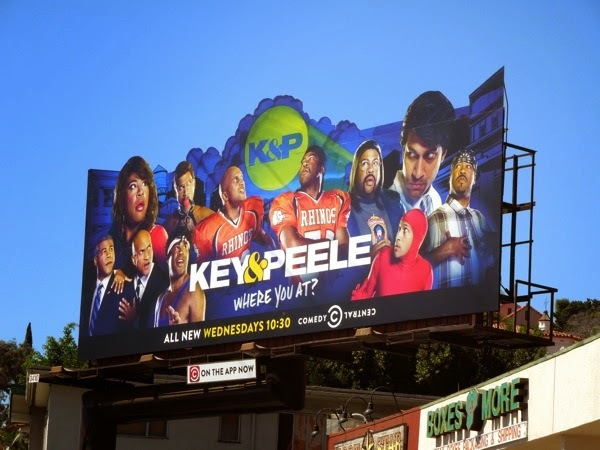 Expect the return of favourites like 'Meegan', 'Luther' the anger translator for 'President Obama', more 'Pizza Order' guy, more College Football players and even more from the biracial comedians not afraid to make satirical observations about America's diverse and multi-cultured world we all live in. 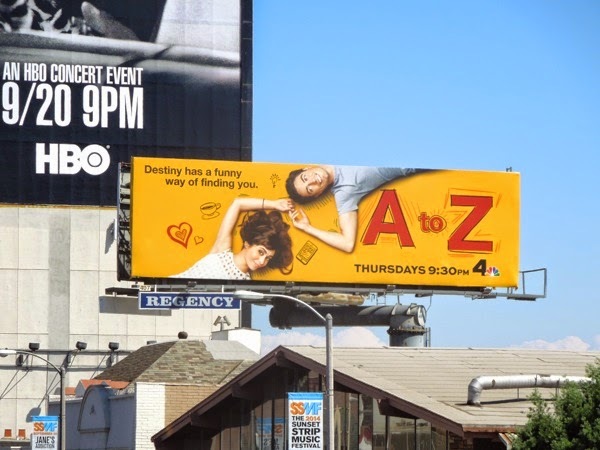 This fun special extension billboard was snapped at the top of La Cienega Boulevard along Sunset Boulevard on September 23, 2014. 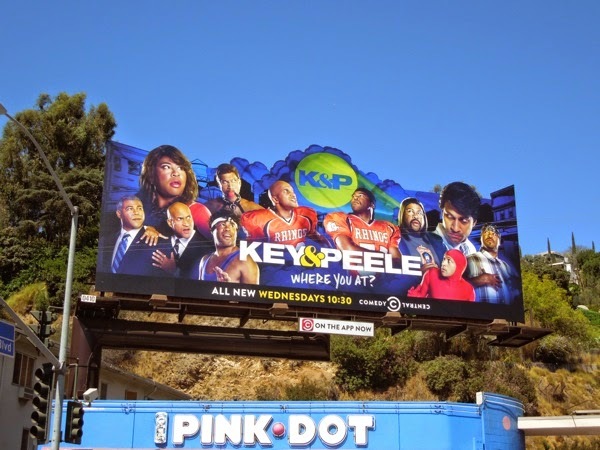 If you're a fan of the funny guys, be sure to check out these previous season promo billboards for Key & Peele here at Daily Billboard, especially their inspired and very timely Donald Sterling Emmy Consideration billboard. 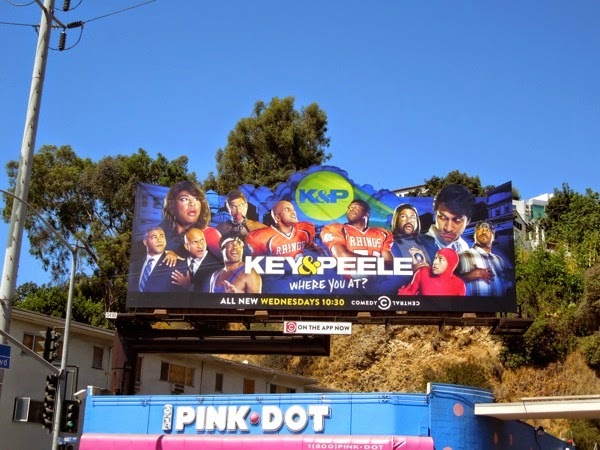 UPDATED: All good things must come to an end and it looks like the fifth season will be the final season for the Key & Peele sketch show. 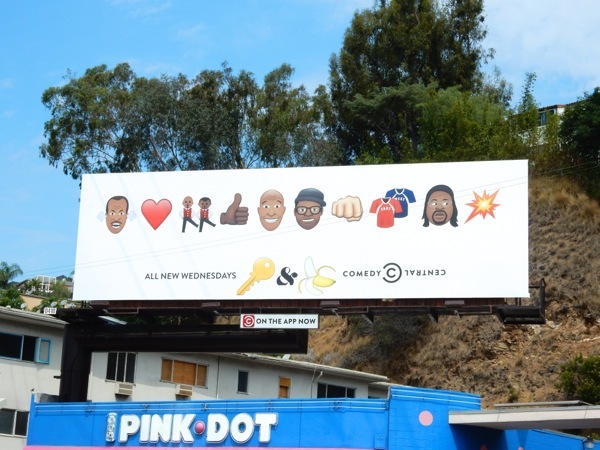 Daily Billboard is sure we'll be seeing more of both of the comedians, and probably on the big screen sooner than you think (especially when you're anger translator to actual President Obama at the 2015 White House Correspondents' Dinner). 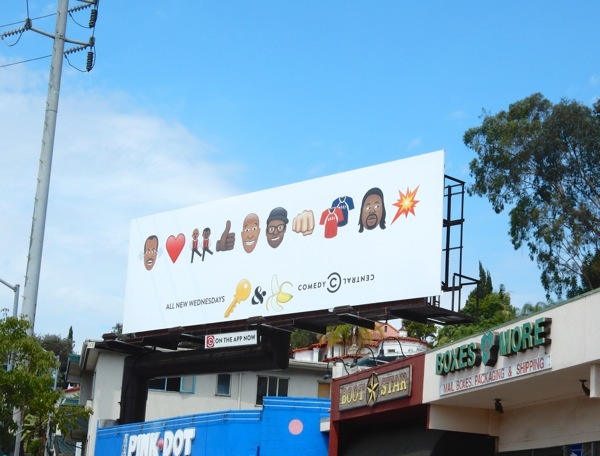 Before they disappear from the small screen though, here's the fifth season emoji-themed billboard snapped along Sunset Boulevard on July 19, 2015, proving that the Comedy Central show still have the finger on the pulse of what's relevant today. 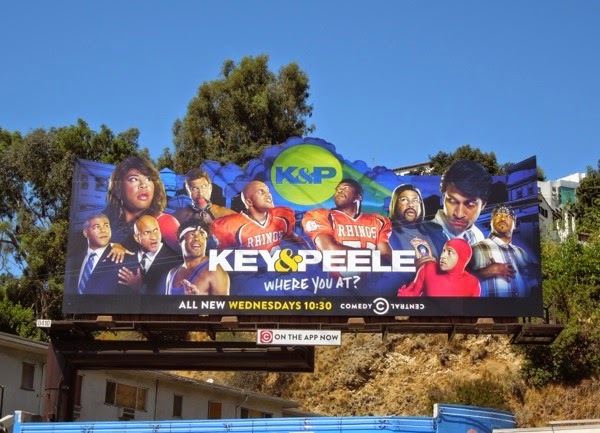 Another day and another new sitcom trying to make an impact this Fall TV season alongside the likes of Marry Me, Black-ish, Selfie and more besides. 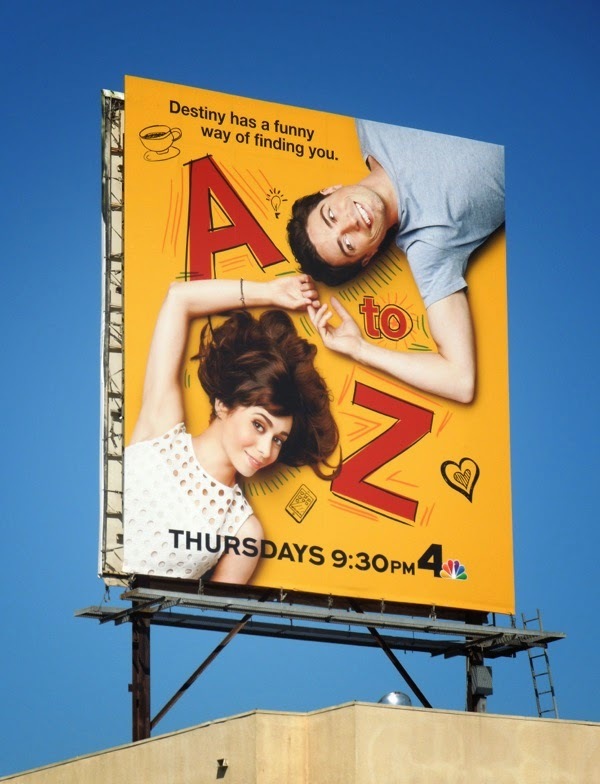 How I Met Your Mother's Cristin Miloti and Mad Men's Ben Feldman prove that not every relationship is as easy as ABC in NBC's new relationship comedy, A to Z.
Idealistic 'Andrew', who works at an online dating company called Wallflower, and no-nonsense lawyer 'Zelda' (did you see what they did with the names?) 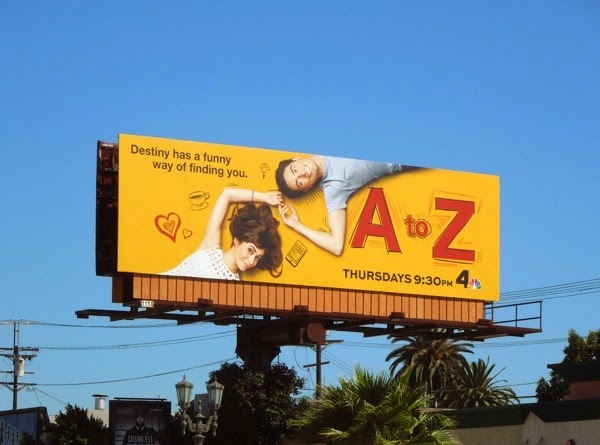 are brought together by a twist of fate and this new show will chronicle their relationship, from their meeting to their break-up. Sounds interesting, although a bit fatalistic, like a ticking time bomb. Most sitcoms and dramas usually prefer to keep you waiting for when the main characters get together, so it will be interesting to see what breaks this couple apart. And is this a concept that can last multiple seasons. 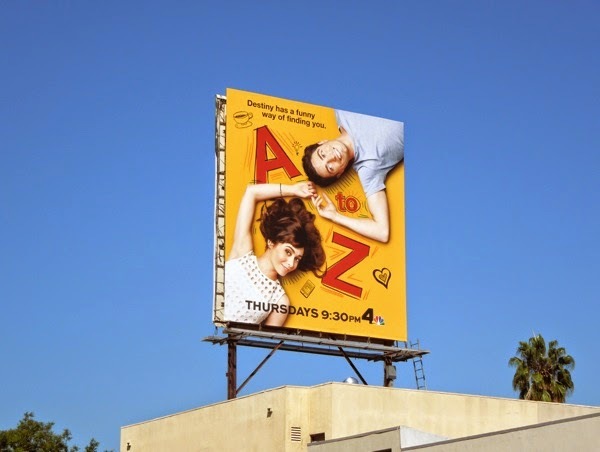 The standard landscape billboard for A to Z was first spied along Pico Boulevard on August 27 and later along Sunset Boulevard on September 14, whilst the squarer version was spotted in the skies over Beverly Boulevard on September 16, 2014. 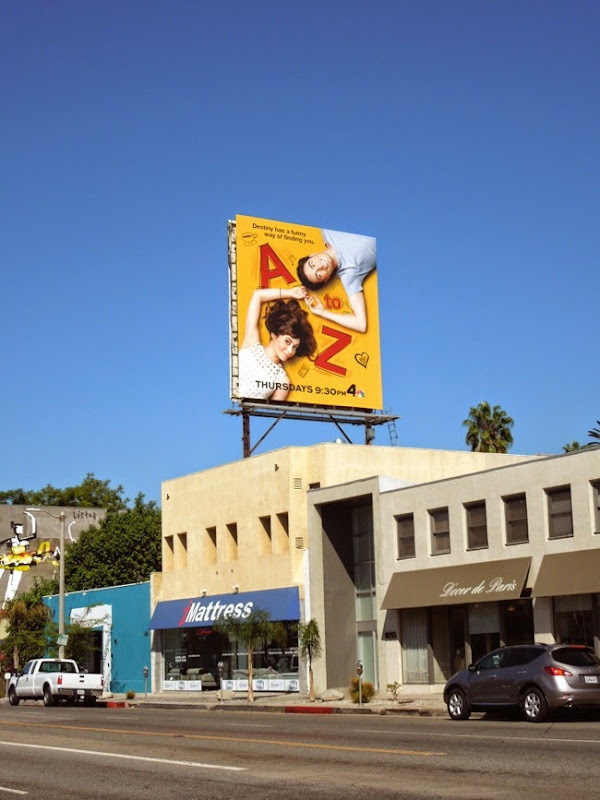 For another kind of A to Z billboard be sure to check out this fun Apple iPad billboard. 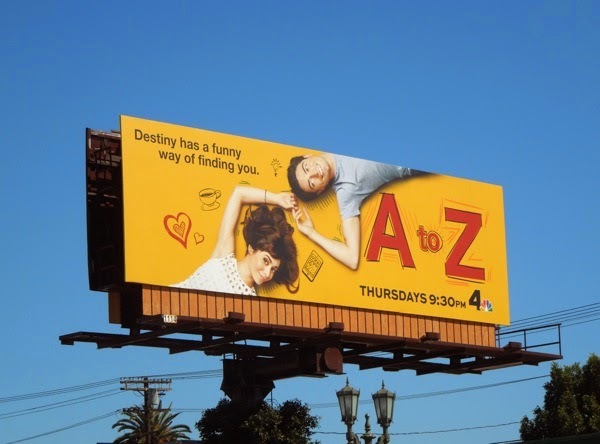 Now let's wait and see if A to Z has the roadmap to your funny bone, or whether it will crash and burn with the countless other failed sitcoms this season. 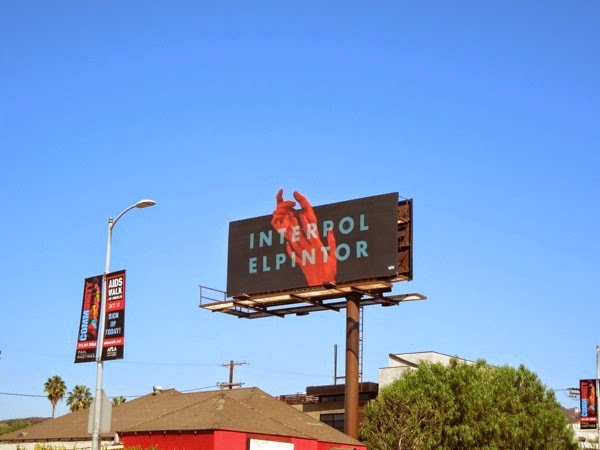 There's something really captivating about this outstretched hands billboard for Interpol's new album El Pintor. 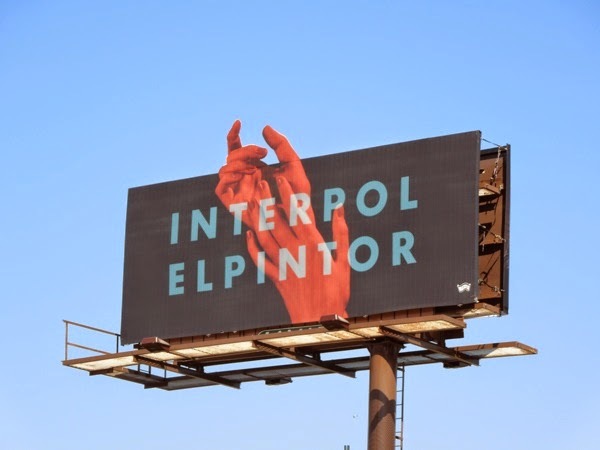 Daily Billboard isn't a huge music aficionado and didn't know whether this special extension ad was for a new TV show or something else, but the intrigue of the visual combined with the Interpol words used in an anagram below the first line of copy certainly made us want to find out more. 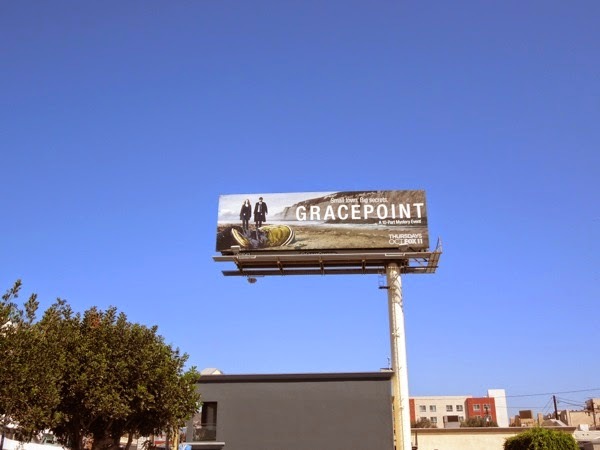 The outdoor ad is actually for the band's first studio album with their new lineup (and fifth in total), without founding bassist Carlos Dengler, with Paul Banks taking on bass duties. 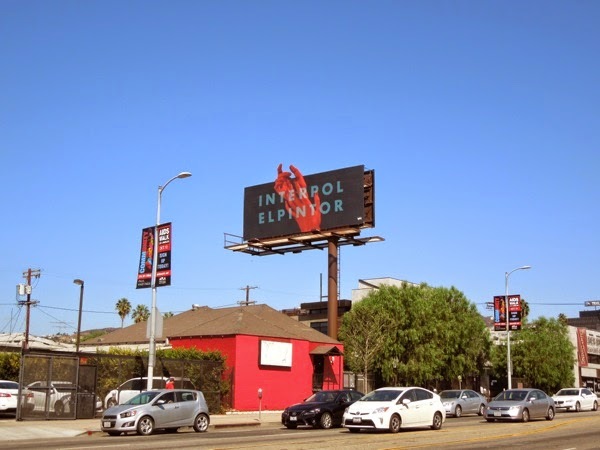 This mysterious and engaging special extension billboard was snapped along Highland Avenue on September 16, and the album was released on September 9, 2014. 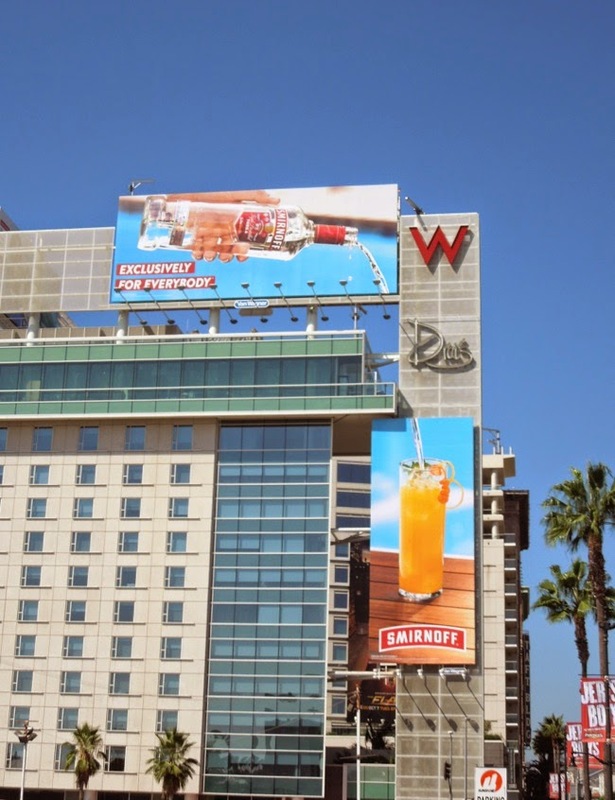 If you like this eye-catching ad, be sure to check out these other cool music billboards, like these Daft Punk Random Access Memories billboards and this Queens of the Stone Age Like Clockwork billboard. Now here's a bit of a gamble. 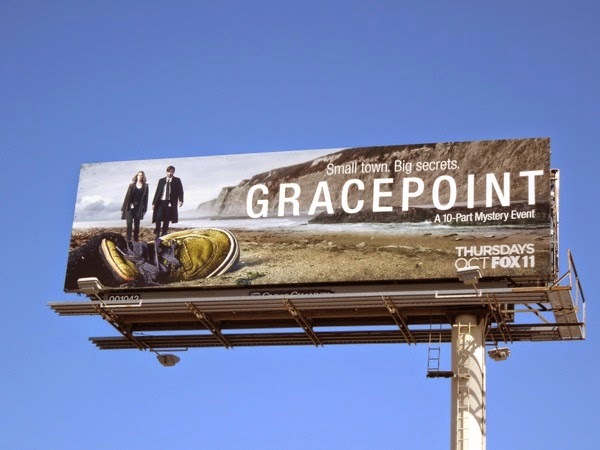 Fox is remaking ITV's critically-acclaimed hit British drama mini-series Broadchurch and renaming it Gracepoint for American viewers. 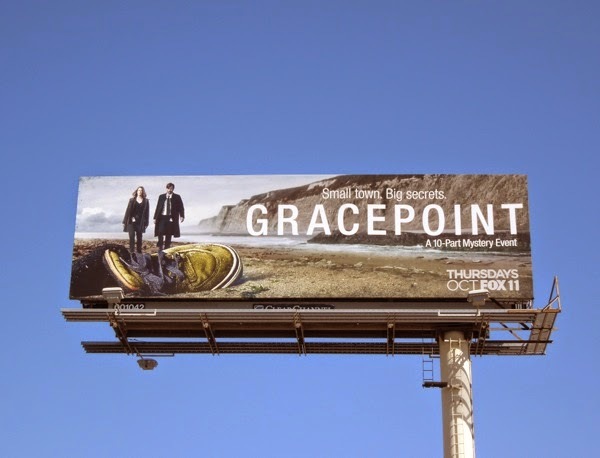 Increasing the number of episodes from eight to ten, the murder mystery will see David Tennant reprise his role, complete with an American accent, as the experienced detective 'Emmett Carver' brought in to investigate this homicide of a 12-year-old boy in a small Northern Californian seaside town, Gracepoint, where friends, family and neighbours all become prime suspects in his death. People may be familiar with David Tennant from his popular stint as the 'Tenth Doctor' in the 50 year old British sci-fi series, Doctor Who, and this time around he'll be partnering with Breaking Bad's award-winning Anna Gunn (not Olivia Colman) as the local detective 'Ellie Miller', initially resentful of this outsider's involvement after being promised the ranking position in her town's police force and hit hard by her connection to the victim's family, her son was the best friend of the murdered boy. Other series haven't faired too well when they've been remade for U.S. audiences, take for example AMC's ten-part series Low Winter Sun based on a British two-part Channel 4 mini-series of the same name that also saw the same actor, Mark Strong, playing both lead roles. In addition The Bridge was also remade from the original Danish-Swedish and The Killing was also adapted from another Danish crime drama. None of them have really found the same success or acclaim of the original overseas versions. 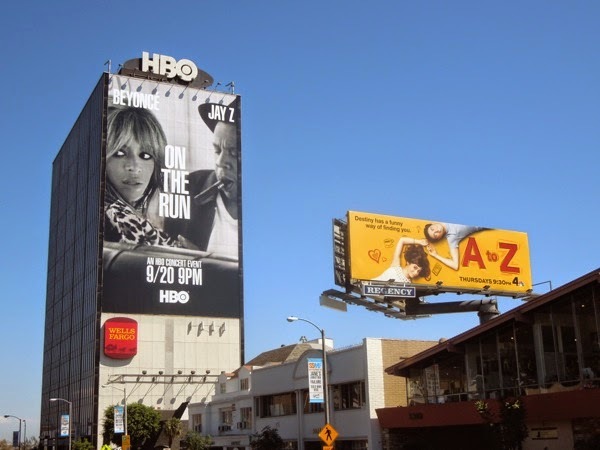 Will this be the show that breaks the mold? 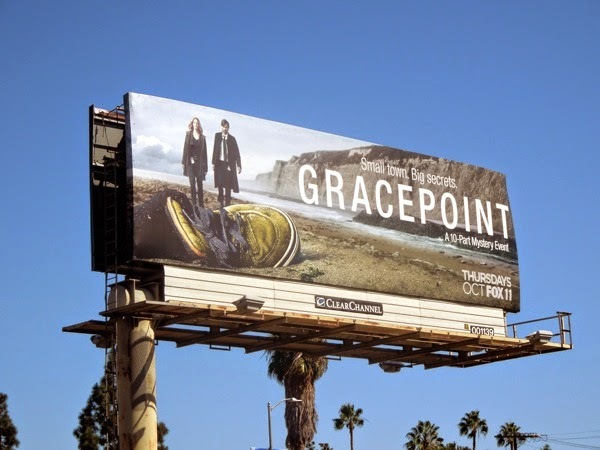 This compelling billboard creative for Gracepoint, showing the detectives approaching a child's shoe on a beach, was first spotted along La Brea Avenue in West Hollywood on September 10, plus later along La Cienega Boulevard on September 14, 2014.
Who killed 'Danny Solano' and will it be the same person as killed 'Danny Latimer' in the original U.K. series? 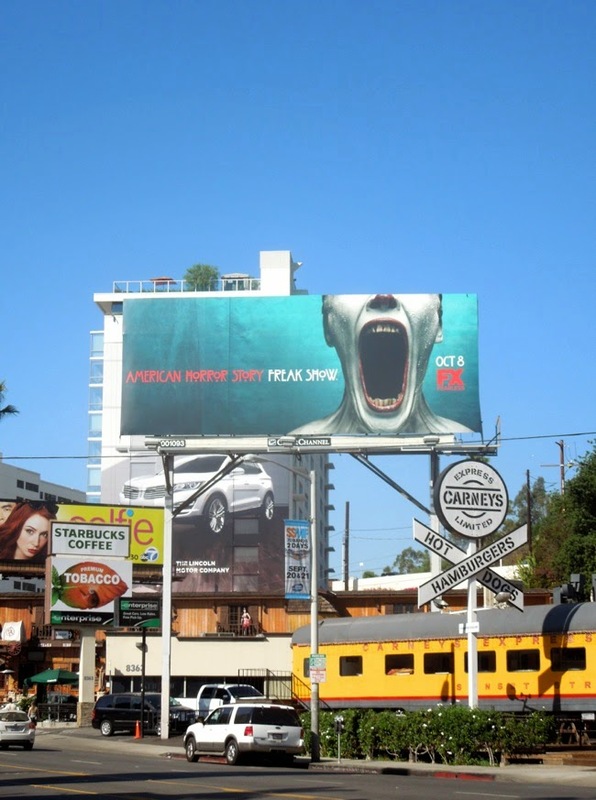 Looks like we're all going to have to watch and learn as the mystery of U.S. remake unravels. 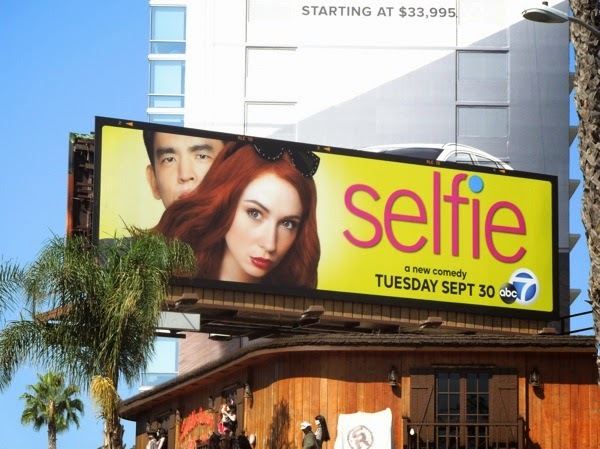 Pitched as a modern retelling of George Bernard Shaw's Pygmalion, Selfie is ABC's new sitcom that shines a light on the self-obsessed social media over-sharing culture we live in today. 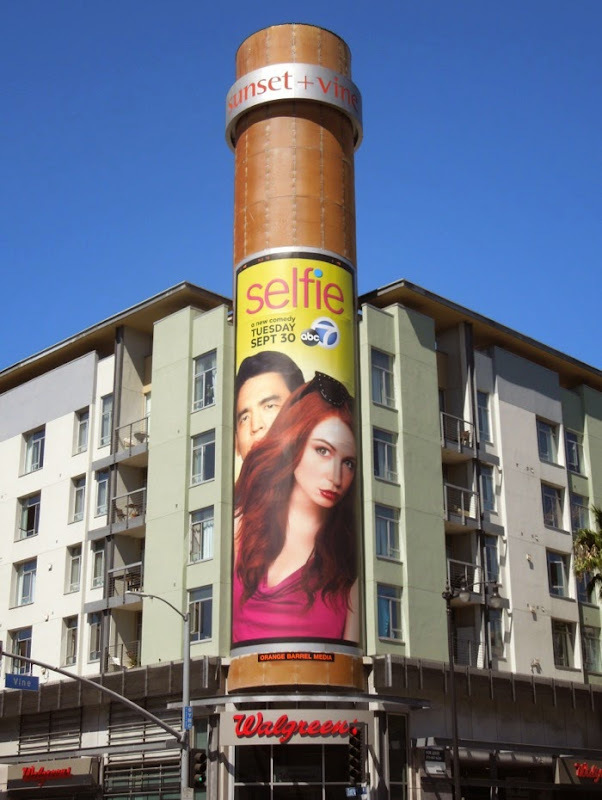 Former Doctor Who companion and Guardians of the Galaxy's 'Nebula', Karen Gillan, stars as the narcissistic 'Eliza Dooley', a sales rep addicted to using hashtags and social media to make herself famous, including copious amounts of 'selfies' on Instagram. After a disastrous incident on a plane that embarrasses her in front of her colleagues, she asks John Cho's 'Henry Higgs', a marketing guru, to help give her a real-world makeover to help her rebrand her image and in the process maybe she'll discover there's more to life than having thousands of followers and making friends with strangers on Facebook. 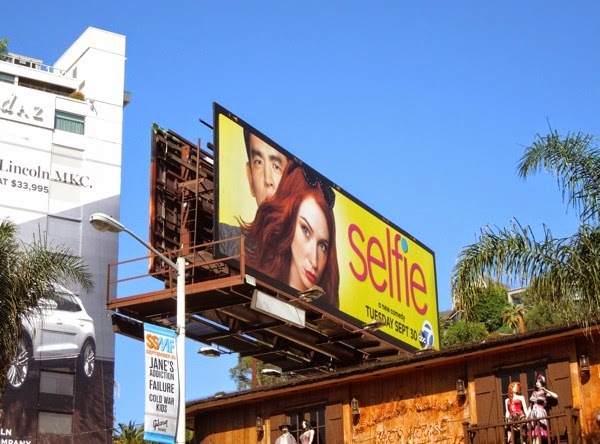 This simple series premiere creative may suggest the sitcom is all about her, but maybe something more like this Best Friends Forever billboard with its camera (or a smartphone in its place) may have gotten the Selfie concept across more immediately. 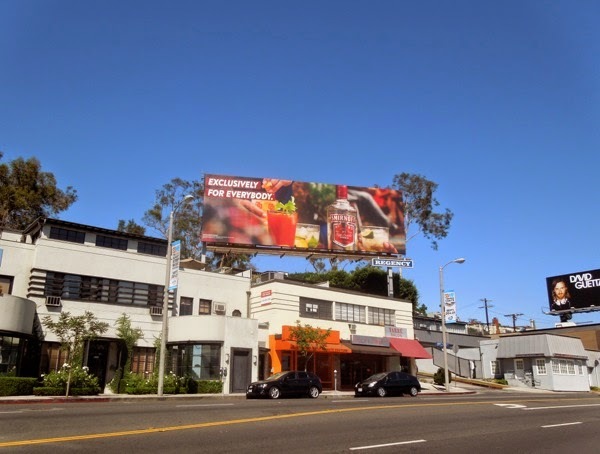 The landscape billboard was snapped along Sunset Boulevard in West Hollywood on September 6, whilst the portrait version was spied at the corner of Sunset & Vine on September 17, 2014. 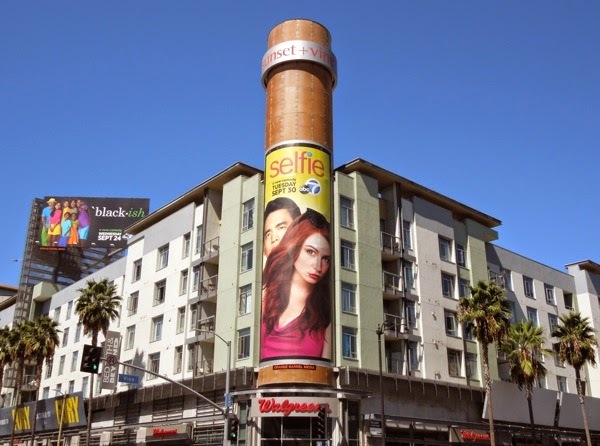 If you're an admirer of Karen Gillan be sure to also check out this Doctor Who season five billboard, whilst if you're an fan of John Cho in these movie billboards for A Very Harold & Kumar 3D Christmas. 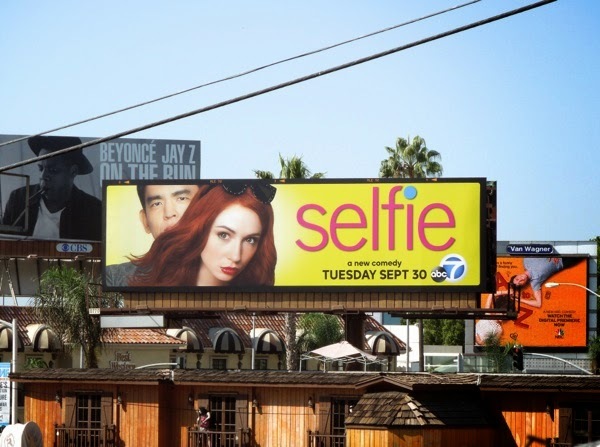 Let's see if Selfie is more than the vapid, self-involved comedy the name suggests it is, or whether it will turn out to be an #epicfail. 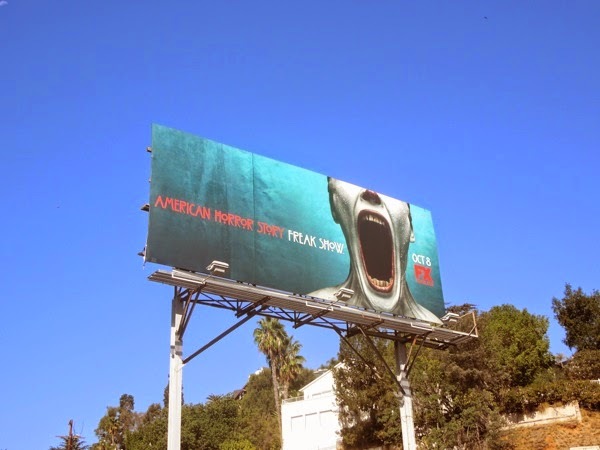 Not to wish it away prematurely, but the one thing that Daily Billboard will miss when American Horror Story comes to an end is their highly imaginative, disturbing and often provocative imagery the show has used for each season of the successful horror anthology series. 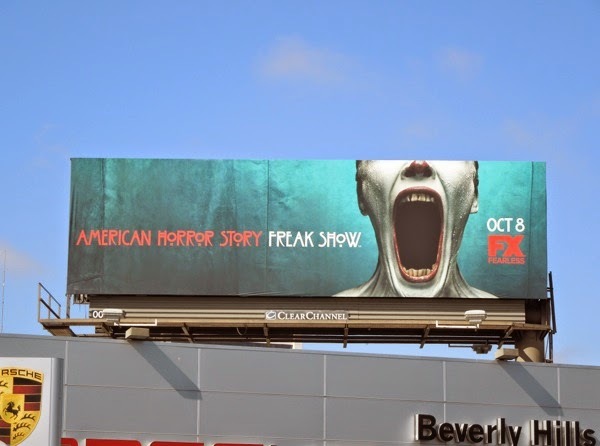 This twisted ad creative for the fourth iteration of American Horror Story, subtitled Freak Show, is no exception. Often a clown's mouth is used at carnival sideshows for games and entrances to tents, but this demonic gaping mouth looks like it could be the gateway to Hell itself. 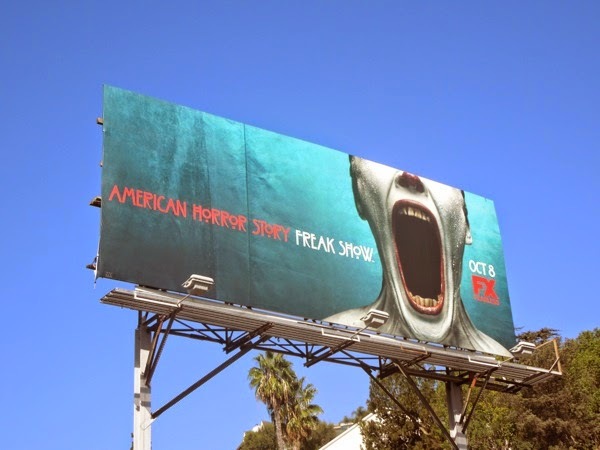 This chapter in the series sees many of the show's stars returning in entirely different roles, with recent Emmy-winning Jessica Lange as 'Elsa Mars', the leader of a troupe of curiosities, including Kathy Bates as a bearded lady, Sarah Poulson playing conjoined twins, a three-breasted Angela Bassett, plus more from regulars Frances Conroy, Denis O'Hare, Emma Roberts and Evan Peters, joined by Michael Chiklis as the carnival's strongman. Set in 1950's Florida this is the story survival for the freakish performers and the local townspeople as a dark entity stirs to threaten all their ways of life. 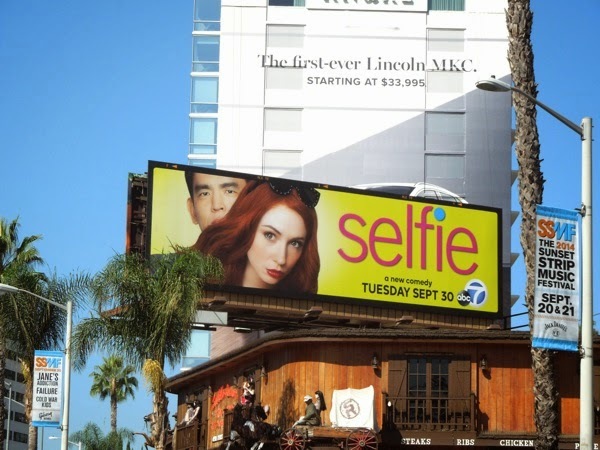 This latest surreal and scary looking billboard was first spied along the Sunset Strip in West Hollywood on September 15, plus later snapped along Santa Monica Boulevard in Westwood on September 22, 2014. 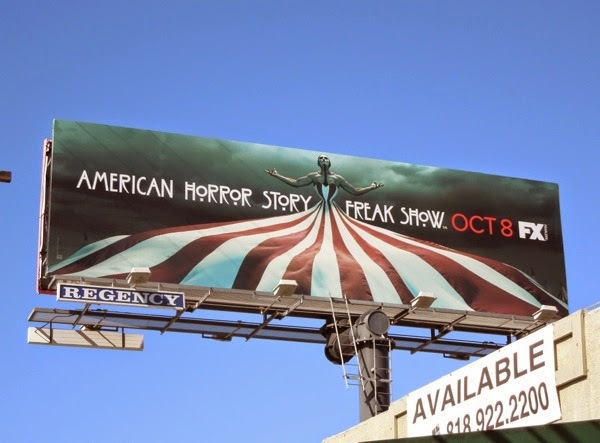 If you're a fan of the show be sure to take a look at all the previous seasons promo ads, including these season one billboards for American Horror Story, AHS: Asylum billboards and AHS: Coven billboards. Let's hope this season is suitably different from HBO's very ambitious Great Depression Dust Bowl era show Carnivàle, which also saw the forces of good and evil, and many shades of grey in-between, intermingle and face off. 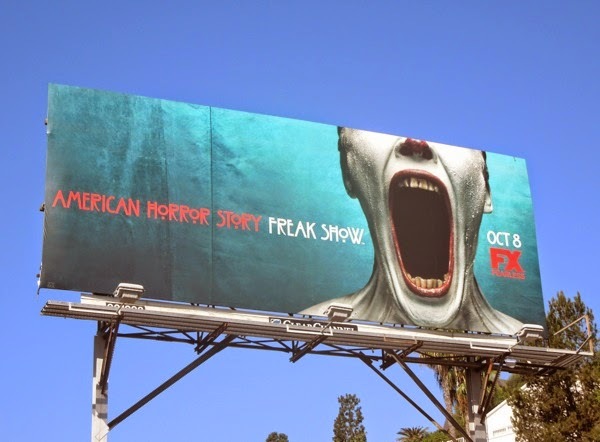 Plus if you're afraid of clowns, we have a feeling that 'Twisty the Clown' and this season in particular, will be the most terrifying yet. 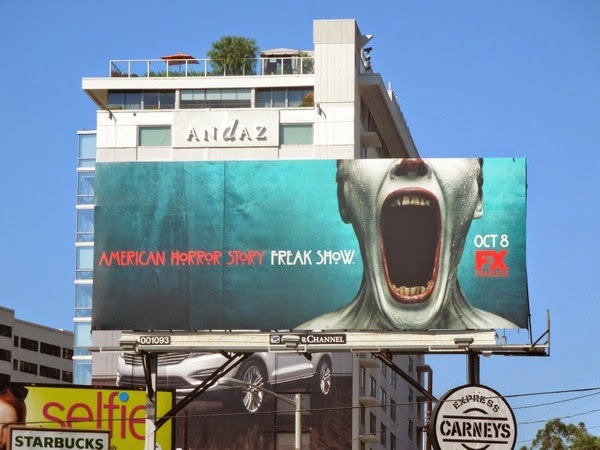 UPDATED: Even though the creepy clown mouth creative seems to be this season's central image, that doesn't mean there's not other billboard creatives for Freak Show lining the skies of L.A. 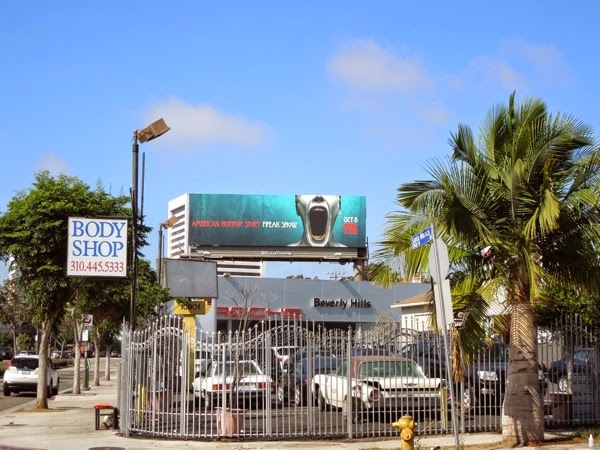 These other disturbing carnival and burlesque themed billboards were spied along the busy Venice Boulevard and Lincoln Boulevard on September 29, 2014. The dramatic circus tent dress version certainly evokes the big top, whilst the woman with the blurred head conjures images of distorting funhouse mirrors and what's not to like about a three-armed sword-swallowng woman with a tiny corseted waist. 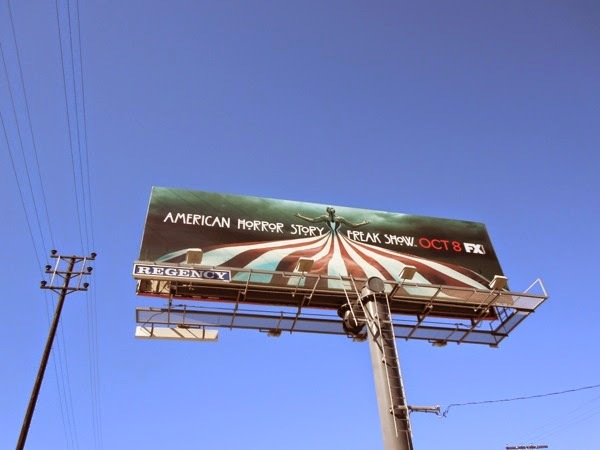 If you like these evocative ads for American Horror Story's new season, be sure to also check out the real-life performers on these AMC Freakshow season two billboards.